To mark their tenth anniversary, gypsy blues bop ‘n’stroll collective The Urban Voodoo Machine release Rare Gumbo through Gypsy Hotel Records/Cadiz Music, in advance of their forthcoming third studio album Love, Drink and Death. Rare Gumbo is a compilation of songs from their first three EPs – collectors’ items originally only available via the band’s early shows, the EPs Sounds from The Urban Voodoo Machine, Ladies and Gentlemen, The Urban Voodoo Machine and With Love From The Urban Voodoo Machine. The release also includes other rare tracks with limited availability and the B-Sides from their first two albums, the debut Bourbon Soaked Gypsy Blues Bop ‘n’ Stroll and its follow-up In Black ‘n’ Red. A treat for confirmed fans, though perhaps the super-fans own many of these tracks already. The opening track, an instrumental, Last Dance Of The Silver Wolf, is a drums-driven stomper with a lachrymose fiddle intro that really rocks, acting as an overture for the rest of the band’s story so far. The album showcases this 6 to 12-piece band’s range of instruments, their accomplished playing and the fusion of many musical styles, with Paul-Ronney Angel’s deep and growling vocals scratching over the top. Stand-out tracks include the hell-raising gypsy tango Corpse In My Trunk, complete with empty bottle percussion that sounds like a skeleton-bone xylophone and the macabre story-telling of Orphan’s Lament. 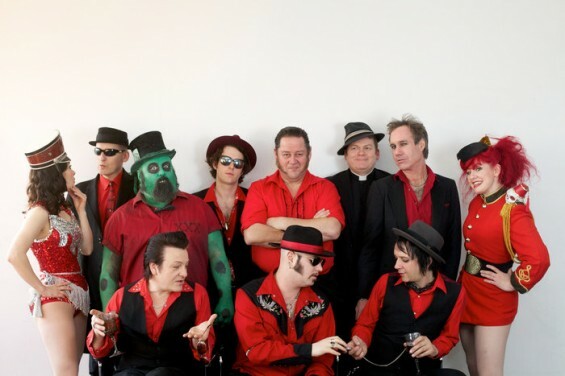 The song-titles are suitably dark and devilish, though titles like You Got Me (By The Balls) are reminiscent of the comedy spoof rock band Spinal Tap; I’m sure the Urban Voodoo Machine have their tongues firmly in their cheeks for that one. This compilation album serves as a fine retrospective celebration of The Urban Voodoo Machine, but is also a great introduction to their music for the uninitiated. The Urban Voodoo Machine play the Glastonbury Festival this week. Check out our review of their live show for an idea of what to expect.